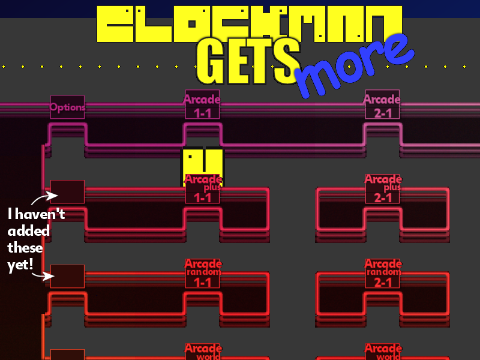 Then we need a Harder mode, so Arcade Plus is below that. Same options, 1-1,2-1, etc but each world having more levels. Below that we've got Arcade Random, which plonks you down in progressively harder, yet completely random levels, once you've got bored of playing the pre-determined selection. Then there's Arcade World, which keeps you stuck inside a specific theme. Only need 1 through 5 for that, though. Not sure what to add to those two end slots, yet, though.. Hmm.. Played enough of Arcade? Why not head back to Classic, instead! Classic is essentially the same as Arcade mode, but with all the extra new stuff taken out again. So, without spoiling things, there won't be any bonus rounds, or ghosts, or other extras. Carrying on down the path, we hit Classic Plus, Classic Random and Classic World. So, that's um.. 7*8 start points, which is 56 whole gameplay start points. Each one starts you off with 0 points on the selected level, and just counts as you go. And with a seperate little highscore for each, that's a whole lotta playing. Because I also have to fit Path mode, Dark mode, Inexplicably Close Camera mode, and whatever else I can come up with. I've 7 slots left over for those, and not sure exactly what each will be, just yet. Oh, and there's a little gap for Options, too, because it's about time I bothered to add some!